Scarlet Emperor runner beans, hydroponic system, wood, coroplast, reclaimed security fencing. Today’s political climate is charged with xenophobic rhetoric and wall building encouraged by global Alt-Right parties. With this project, I intend to put forward hopeful and critical gesture in the face of these challenges. 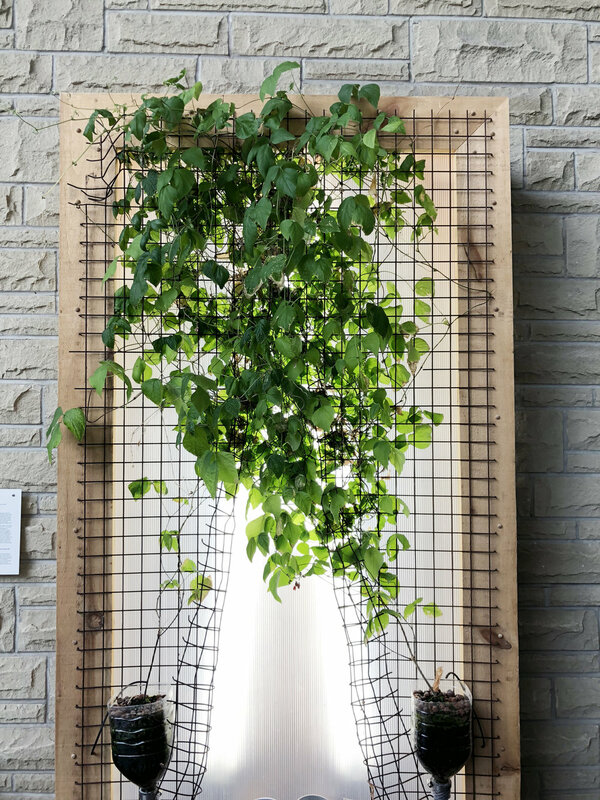 This sculpture is composed of a found section of security barrier, live plants and a functioning hydroponic system. The fence is split up the center, as though someone were attempting to pass through. On either side of this cleft, beans climb upward. The plants will join at the top of the divide, effectively turning what was once a barrier into a lattice for supporting future growth and connection. As one of humanity’s oldest cultivars, beans can remind us of the rewards of working together to cross boundaries and limitations. When the beans eventually bloom and produce edible pods, they will be shared in small communal meals to foster discussion about issues of solidarity in these divisive times.